The University of Southampton has been awarded the international standard for environmental management and now sits alongside some of the world's leading companies including Rolls Royce and Lloyd's Register. In receiving the EcoCampus Platinum award, the University has also achieved the international standard for environmental management systems – ISO 14001. EcoCampus is the national environmental management system (EMS) and award scheme for the higher and further education sectors. The scheme enables universities to systematically identify, evaluate, manage and improve their environmental performance and practices. 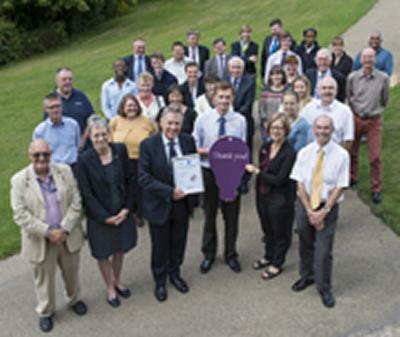 Southampton’s award follows an extensive audit in July 2014 after almost three years’ work by the University to implement its EMS. The EMS builds on many years of work to improve the University’s environmental performance, including the commissioning of the Combined Heat and Power plant on its Highfield Campus and the running of Uni-link buses. An EMS is simply a way for an organisation to manage and minimise its harm to the environment. Criteria for EcoCampus have included legal compliance, prevention of pollution and student and staff awareness. Crucially, EcoCampus also includes the embedding of sustainability into university curriculums – work that Southampton’s Sustainability Action team have led. Professor William Powrie, incoming Chair of the University’s Environment and Sustainability Advisory Group, says: “This is a major milestone for the University and the product of many years work. I’d like to say thank you to all the staff and students who have directly contributed to this achievement, and also to everyone whose everyday actions around the University are helping to improve the sustainability of our campuses."